To use, add soup base to 12oz of hot water. 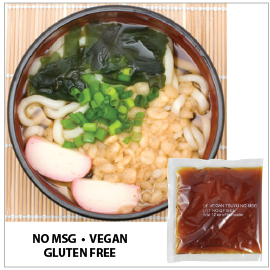 Miso (Water, Soybeans, Rice, Salt, Alcohol), Water, Soybean Oil, Sugar, Garlic Puree (Garlic, Citric Acid), Salt, Ginger Puree (Ginger, Water, Salt, Critic Acid), Seasoning Oil (Soybean Oil, Garlic), Miso Powder (Red Miso (Fermented Soybeans and Salt)), Yeast Extract (Yeast Extract, Maltodextrin), Hydrolyzed Vegetable Protein (Hydrolyzed Soy Protein, Safflower Oil), Yeast Powder, Ginger Powder, Japanese Pepper, Sesame Seeds, Black Pepper, Red Pepper, Orange Peel. 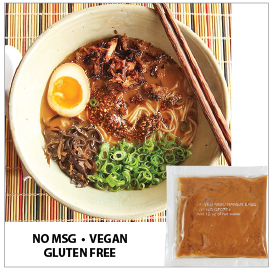 Water, Soy Sauce (Water, Soybeans, Salt, Alcohol), Salt, Soybean Oil, Salted Mirin (Water Dextrose, Rice, Corn Syrup, Salt), Sugar, Yeast Extract (Yeast Extract, Maltodextrin), Seasoning Oil (Soybean Oil, Onion, Ginger), Hydrolyzed Vegetable Protein (Hydrolyzed Soy Protein, Safflower Oil), Caramel Color, Caramelized Onion (Caramelized Onion Juice Concentrate), Xanthan Gum, Garlic Powder, Citric Acid. 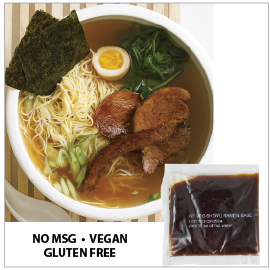 Water, Soy Sauce (Water, Soybeans, Salt, Alcohol), Sugar, Salt, Kelp Extract (Kelp Extract, Sugar Alcohol (Sorbitol, Maltitol), Alcohol, Salt, Xanthan Gum), Yeast Extract (Yeast Extract, Maltodextrin), Kelp Extract Powder (Maltodextrin, Kombu Extract, Salt), Hydrolyzed Vegetable Protein (Hydrolyzed Soy Protein, Safflower Oil), Shiitake Extract (Maltodextrin, Shiitake Extract, Yeast Extract (Yeast Extract and Salt)), Vinegar (Water, White Distilled Vinegar).